Benjamin Franklin popularized the sentiment that nothing is certain “except death and taxes.” But the public isn’t too keen on the current federal tax system, with 59% saying there is so much wrong that Congress should completely change it (38% say it works pretty well and needs only minor changes). As April 15 rolls around yet again, here are five facts about Americans’ views of taxes. 1Americans have several complaints about the federal tax system, most notably the impression that some corporations and wealthy people don’t pay their fair share. Almost two-thirds (64%) say they are bothered a lot by the feeling that some corporations aren’t paying what’s fair in federal taxes, and 61% say the same about some wealthy people. 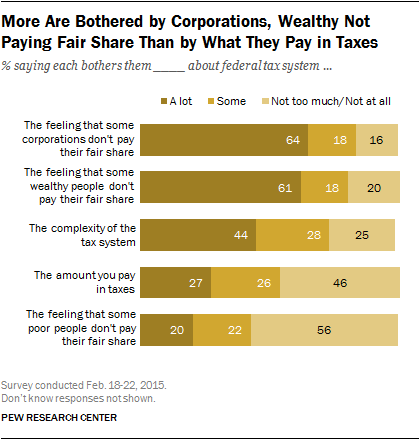 Just 20% say they are bothered a lot by the feeling that some poor people don’t pay their fair share. A greater share – 44% – say the complexity of the tax system bothers them a lot. Democrats are more likely to complain about corporations and the wealthy not paying their share, while Republicans register more irritation with the system’s complexity, the amount they pay, and some poor people not paying their fair share. 2While four-in-ten (40%) say they pay more than their fair share considering what they get from the federal government, 53% say they pay about the right amount. Just 4% say they pay less than their fair share. Opinion varies considerably based on annual family income. Among those making $100,000 or more, 54% think they pay more than their fair share; among adults with incomes less than $30,000, just 27% say this. 4The IRS gets mixed reviews from the public, in contrast to the favorable ratings given to many public agencies. Just 45% of Americans have a favorable rating of the IRS, compared with 48% who rate it unfavorably. (This sentiment has changed little in the last several years.) Partisans are greatly divided when it comes to the IRS. While a majority of Democrats have a positive view of the agency (62% favorable), Republicans, especially Tea Party Republicans, dislike the IRS. Among Republicans and Republican-leaning independents who agree with the Tea Party, 15% are favorable toward the IRS and 82% are unfavorable. 5Only 6% of Americans think it is morally acceptable for people not to report all their income on their taxes, according to a January 2013 Pew Research survey. The vast majority of the public (71%) says this practice is morally wrong, while 19% think failure to report income isn’t a moral issue. Few of any partisan persuasion think that not reporting their full income is morally acceptable: Republicans (5%), Democrats (7%) and independents (5%) are about as likely to say this. However, Republicans are more likely than Democrats to call this morally wrong (78% vs. 68%), while Democrats are more likely to frame it as “not a moral issue” (21% vs. 15%).